Here are some of the more common structures of financing renewable energy project. They vary in the type of participants, source of financing and allocation of benefits. One corporation develops the project and finances all costs. There are no other investors or lenders involved. The project may be set up as a subsidiary of the corporate parent. However, with 100% ownership, the subsidiary would have to be consolidated into the parent's financial accounts. Naturally, the corporation reaps all the benefits of the project. The corporate parent must have sufficient capacity for tax credits and benefits to be of use. In the renewable energy sector, this is structure is rare and only used by utility companies themselves. The developer acquires lease and land rights, permits, interconnection agreements, power purchase agreements and any renewable certificates or feed-in-tariffs. The developer sells the developed project to a strategic investor and receives a development fee from the investor. The strategic investor (possibly a utility company) constructs the project on its balance sheet or arranges bridge finance for the construction. The strategic investor owns and operates the plant. The developer's risk is limited to the development capital. Construction Loan: Bank is repaid in full at completion of construction. Alternatively, bridge is converted into long-term loan. Cash Equity Bridge: Bank is repaid at completion of construction with funds from sponsor. Developer may provide limited guarantee for cash equity. 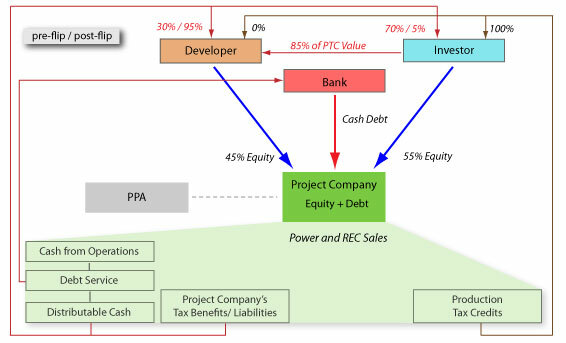 Tax Equity Bridge: Bank is repaid at completion of construction with funds from tax investor, who will only come in once the plant produces tax credits. The investor contributes almost all of the equity and receives a pro-rata percentage of the cash and tax benefits prior to a flip in allocation. At a given level of IRR (internal rate of return), the ownership flips back to the developer, after which most of the cash and tax benefits are allocated to the developer. Only the production tax credits will continue to go to the tax investor even after the "flip". If the investor is a tax investor rather than a strategic investor, the pre-flip allocation may not be pro-rata, and all tax benefits may go to the investor instead. This is the most common project finance structure. 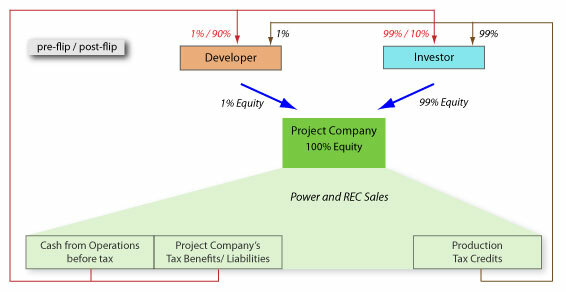 The tax investor makes contributions before production begins, though a portion may be deferred until the project receives production tax credits, which are initially allocated to the tax investor, though a high percentage is paid to the developer as an equity contribution. This serves as a claw-back should the project not perform. The leverage is at project level with long-term debt of up to 18 years, based on the PPA (Power Purchase Agreement). This structure also includes a return-based flip in the allocations. As the term for the production tax credits is usually, an additional loan may be secured against those flows. Similar to the Investor-Ownerhip-Flip structure. However, the developer is leveraging its equity stake in the project using debt financing. The tax investor commits equity upfront. Pre-Flip: Initially, 100% of cash goes to the developer until return of investment (similar to a development fee). Then 100% goes to the investor. 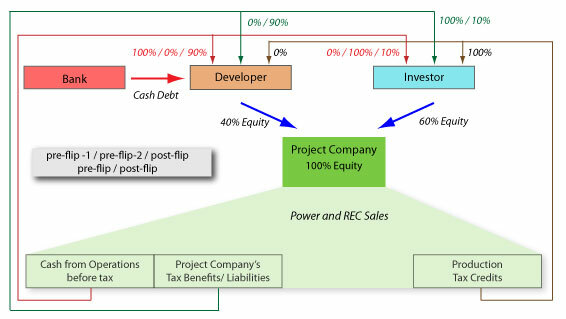 Post-Flip: After the investor's pre-agreed IRR (typically 7% - 10% depending on project risks) is reached ownership and cash flow allocations go back to the developer, including most of the tax benefits. Construction is funded by sponsor equity and a construction loan. Once constructed, the sponsor sells the project to the investors that have formed a trust and immediately leases it back. The develpoper repays the construction loan from the sale proceeds. The trust is financed with cash equity and a non-recourse term debt. Lease payments are likely to be assigned to a lender. For tax purposes, a minimum of 20% equity is usually required. Leasing generates a "time value of money" cost saving achieved by deferring tax payments. It also improves cash flow. If set up as Operating Lease, the lease may only be for 5 years with the option to re-lease. When homeowners invest in renewable energy generators, they will own 100%. However, quite frequently, they can get bank finance, in some cases up to 100% of the capital costs! Depending on the jurisdiction, homeowners may have to set up a company to run the generator, in whcih case they will also be able to profit from tax benefits. However, unless they can offset the investment against profits elsewhere, the overall tax benefits are not significant. The lack of tax benefits, however, is often compensated for by higher feed-in tariffs for small installations..